Since video clips first began circulating of Kelly Slater’s wave pool in Lemoore, CA, surf fans have waited impatiently for their opportunity to see the man-made wonder in person. This past weekend, they finally had their chance as the Surf Ranch hosted the Founder’s Cup, its first event open to the public. No, the average surfer did not get the chance to surf the now-famous wave, but attendees got an up-close look at what some are calling the world’s most perfect wave. The Founder’s Cup is not the first time a surf contest has taken place in a wave pool. A 1985 event in Allentown, PA, crowned Tom Carroll as the first ever “Inland World Champion.” But this weekend’s event surely marked a departure for a sport that until now has been as much about reading the ocean’s unpredictable intentions as it is about whipping perfect turns. 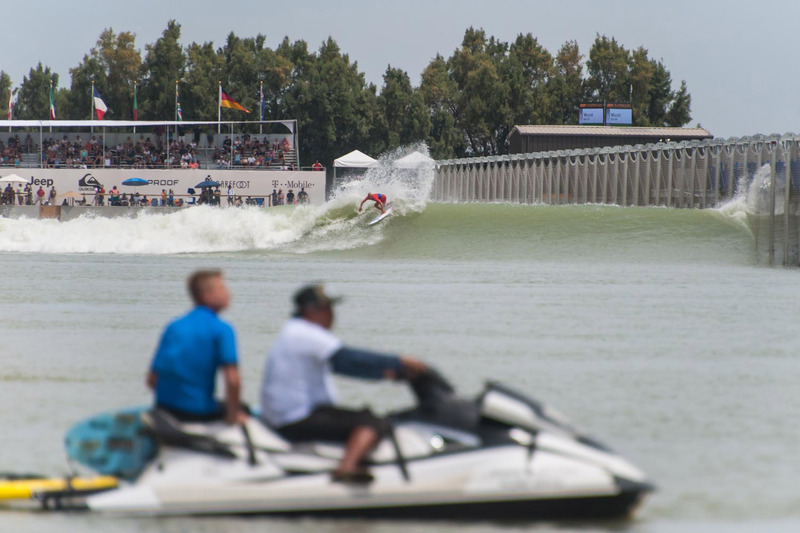 The Founder’s Cup featured a team’s format designed to model a possible Olympic event, which the World Surf League is hoping will take place in a wave pool in 2020. “We would love for the Olympics to be in a wave pool,” Sophie Goldschmidt, CEO of the World Surf League, told Men’s Journal. The “world team” led by South African Jordy Smith won the event, followed by Brazil and the United States. We spent two days in Lemoore soaking in the scene. Here’s what we learned. Surfing the perfect wave looks more difficult than we expected. More wave pools could be on the way. 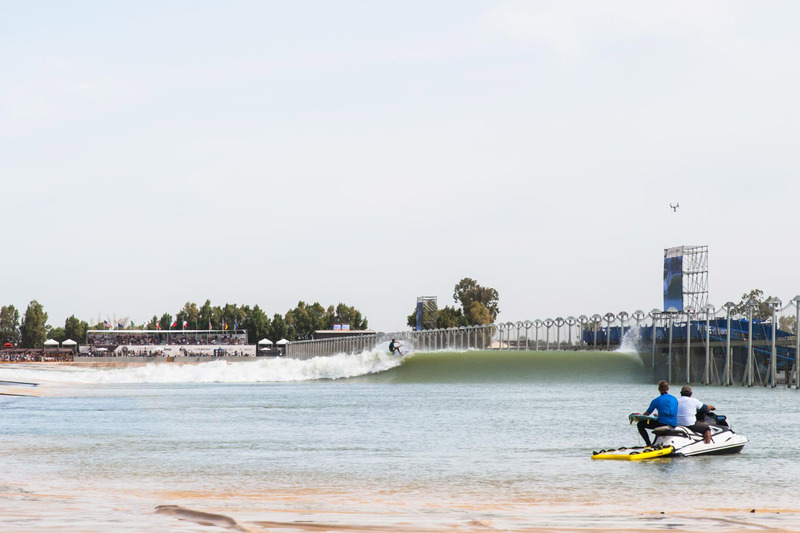 The Olympic surf event might actually happen in a wave pool. In 2020, Tokyo will host surfing’s first Olympic event, and it’s currently slated to take place at Tsurigasaki beach in ocean conditions. “I would love it to be in something like this,” Slater says. “Everyone knows what they have to do, and you just see those skills come out under the pressure.” There’s also the ease of scheduling in a man-made environment that isn’t subject to the vagaries of the tides. “We can now say, ‘At 8 o’clock on a Saturday morning, we’re going to run,’” Goldschmidt says. Longer waves are not always more fun. Every surfer dreams of surfing a long ride down a clean wall of water, but turning a performance shortboard requires some solid effort. Ride a point break, and your legs will almost certainly be burning by the end. The right-breaking wave at Lemoore lasts for 40 seconds, which is several lifetimes when compared with the average beach break. Slater says now that it might even be too long. “Future versions might be 30 seconds,” he says. “I rode three full lengths of the pool today, and my legs are feeling it.” Slater thinks a 30-second wave or shorter might allow surfers to push more radical turns, because they won’t be as worried about saving energy. Wave pool events may make surf contests easier to watch for some casual fans. If you attend a wave pool event, expect a party. Surfing will still take place in the ocean. For most of us, surfing will remain an ocean-based endeavor. We’ll drive to our local beach, walk down the sand, and paddle out in the salt water. Goldschmidt expects that at least some Championship Tour events will also continue to take place at ocean venues. “The ocean will always be the core of what we do,” Goldschmidt says. “It’s what makes surfing so special.” But over time, pro surfing will feature a mix of ocean and man-made venues. As they fine-tune the mix, the WSL hopes that it’ll draw new fans without alienating the sport’s long-time supporters.